These nasty pests, which moved into Washington a decade ago, are much more damaging and harder to deal with, plus they have multiple generations per year. THERE’S A NEW pest in town. I’ve been receiving more and more questions about an insect that is ruining the appearance of rhododendrons and azaleas. 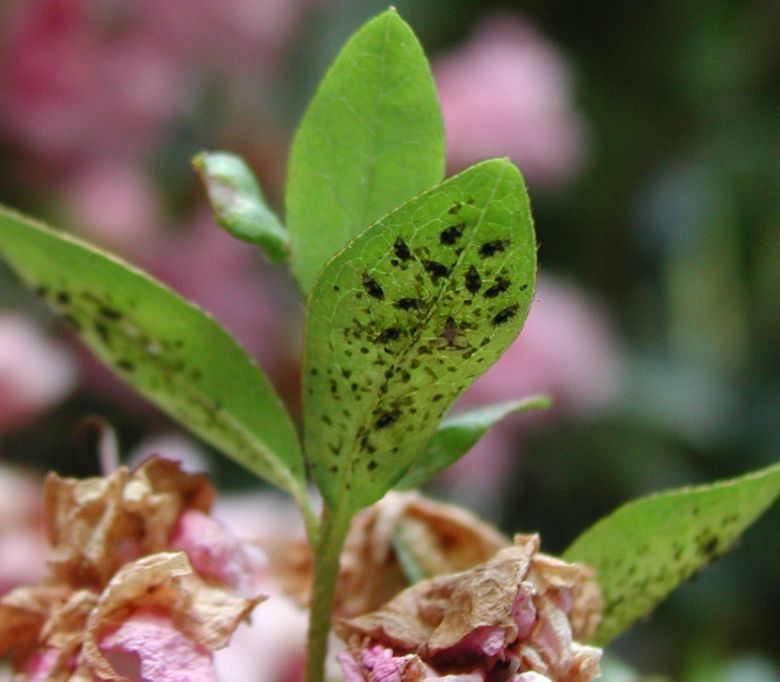 If you’ve noticed that the leaves on these plants are becoming mottled and unattractive, there’s a good chance that your plant is under siege from Azalea lace bugs. These troublemakers are quarter-inch-long insects with flat, lacy wings patterned with a white-and-dark, windowpane look. Immature nymphs are tiny and look like yellowish spots. You’ll see them on the underside of the leaves, along with telltale, sticky tar-like spots of frass (polite word for bug poop) and shed skin. Adults and nymphs cause damage by sucking the life out of individual leaf cells. 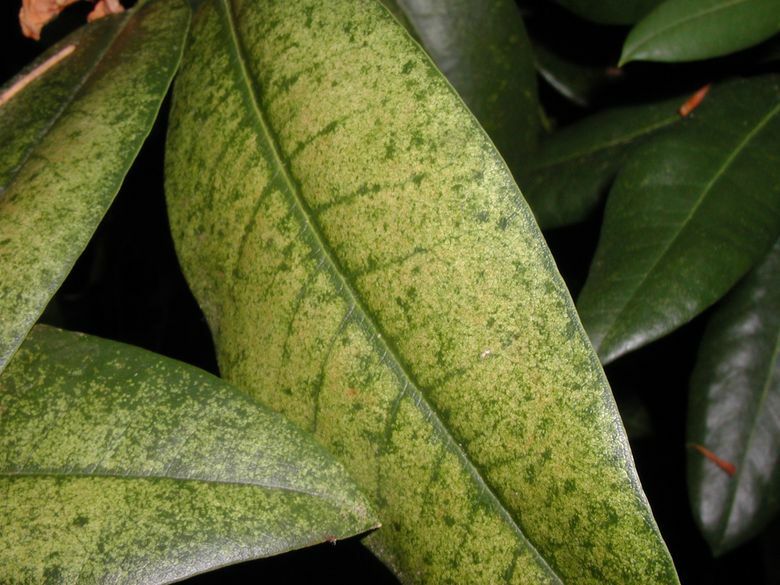 The initial damage usually shows up as light yellow or gray stippling on the surface of the leaves, but as populations increase, the severity of the damage increases. Leaves turn nearly white on azaleas. On rhododendrons, the leaves turn dirty yellow, with only the veins remaining green. Very heavy infestation can result in premature leaf drop, leaving the plant thin and leggy and, in severe cases, weakening the plant to the point it eventually dies. This insect most often attacks evergreen azaleas and rhodies, but deciduous azaleas and Mountain laurels (Kalmia) are susceptible as well. Lace wings have been bothering rhododendrons for a long time, but in the past, they were a fairly easy pest to deal with. 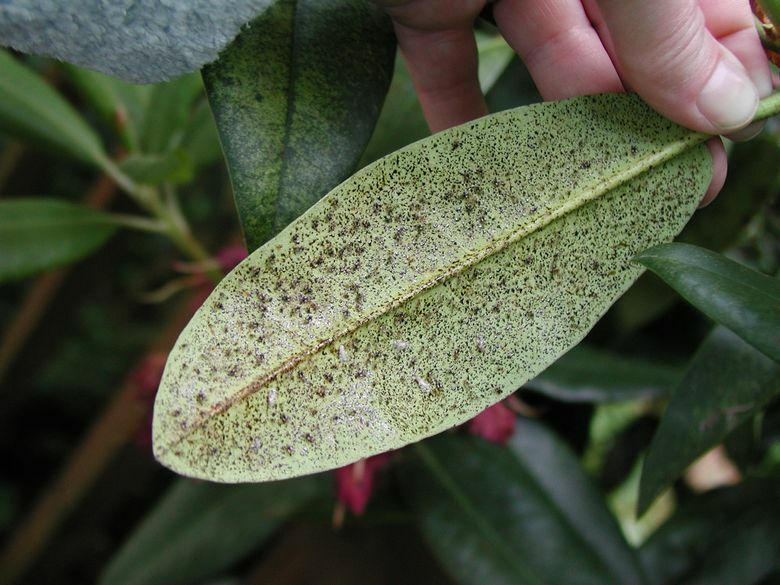 Then, the only lace bug that infested these plants was the rhododendron lace bug. It had only one generation per year, hence only one treatment generally was required to control the insect. 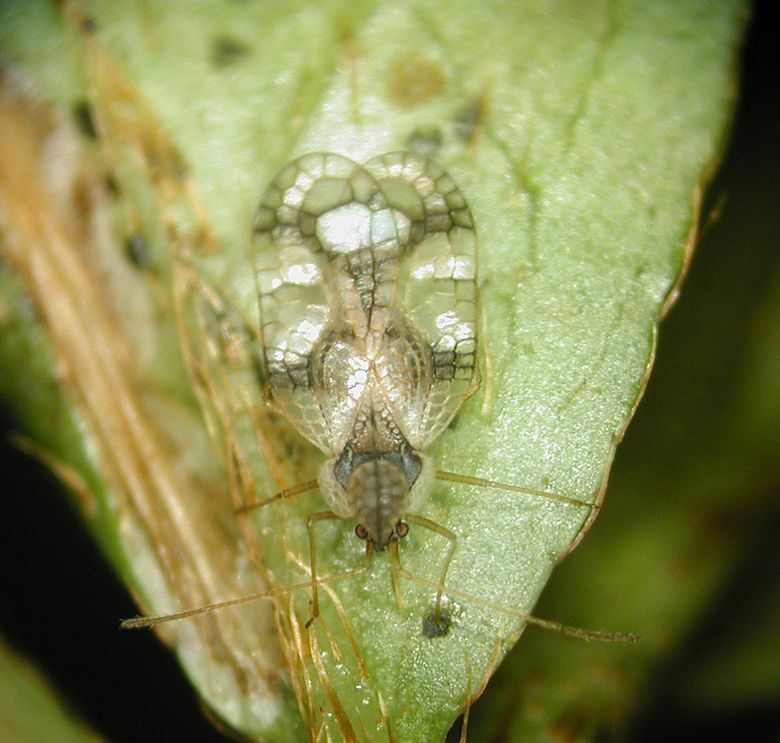 Unfortunately, in 2008, the azalea lace bug moved into Washington. This insect is much more damaging and harder to deal with than the rhododendron lace bug because it has multiple generations per year. 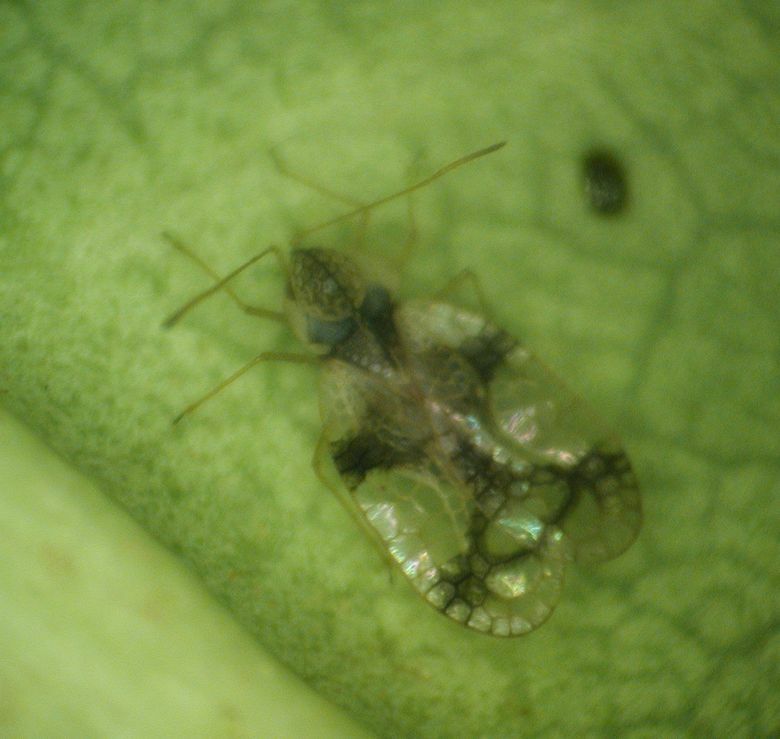 Eggs that are laid in the midrib on the underside of leaves first hatch in mid-May, but those infestations are followed by later generations in June, July and August. The hot, dry summers we’ve been experiencing the past few years are adding to the problem. 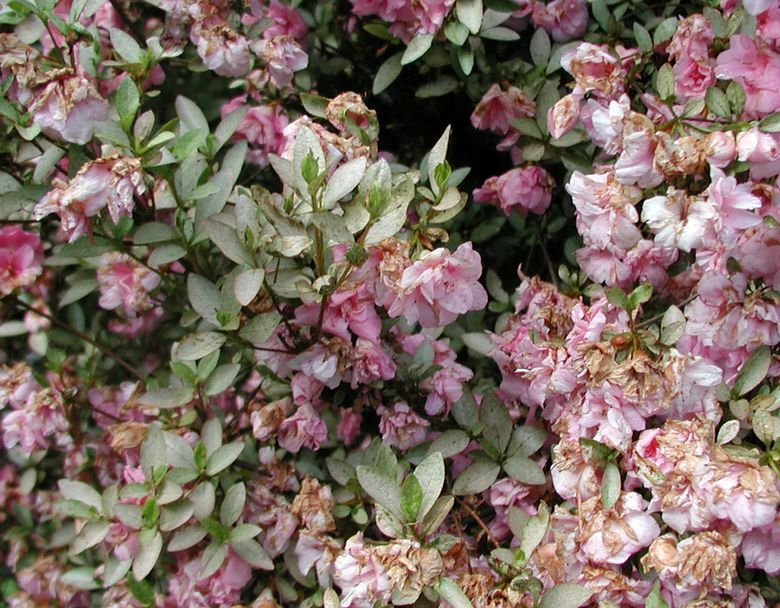 Studies have shown that drought-stressed plants are much more susceptible to lace-bug attack. There is no panacea when it comes to controlling this pest. There are few, if any, natural predators to help keep populations low, and although natural sprays such as neem oil are generally effective, because there are multiple generations, repeat applications are necessary. Begin by looking for eggs that appear as brown spots along the veins on the underside of the leaves, and put the “el kabotski” on them by squishing them with your fingers or spraying them with neem oil. Monitor regularly for the adults and nymphs and the tar-like black feces. At first sign, treat with neem oil, making sure to heavily coat the undersides of the leaves. Studies have found that rhodies and azaleas growing in full sun are nearly twice as likely to get infested as those growing in partial shade, so if possible, move plants to a location in partial shade. Reduce stress by watering and fertilizing appropriately. Perhaps the worst thing about this insect is that once the leaves are maimed, the plants typically look horrible. Even if you take the necessary steps and manage to get the pest under control, it can take a number of years before the plant will look decent again. So, unless the affected plant is something pretty special, the sad truth is that the best solution might be to replace it with a different kind of plant that isn’t susceptible to this nasty pest. Hey — just be grateful that azalea lace bugs don’t attack Brussels sprouts. Ciscoe Morris: ciscoe@ciscoe.com. “Gardening With Ciscoe” airs weekly on KING 5; check local listings.